Downtown Nantucket is a quaint former whaling village, with cobblestone streets running between shops, ice cream stands, and museums. The tree canopy is really pretty and there are gorgeous historic New England buildings and Captains homes. The side streets can be narrow, and are often very crowded in high summer, but they can make up a fun run if you run early in the morning or in the off-season. 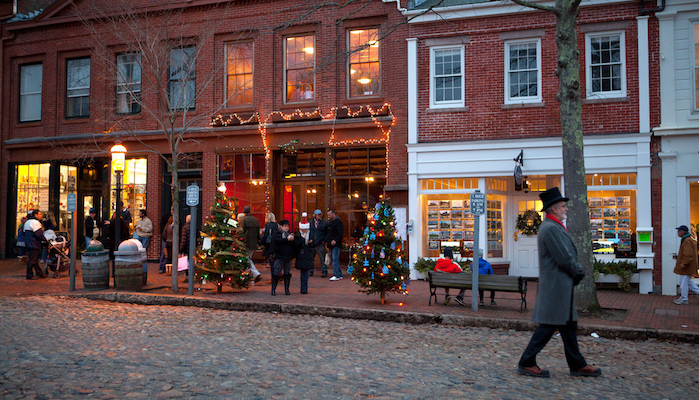 (Just watch your feet — raised brick and cobblestones can be a tripping hazard). Most of the streets around downtown have sidewalks and are lit at night. You can create your own route or follow our 3-miler highlighting the best streets. Start at Straight Wharf with a quick little loop of the Historic District: Main St., RIGHT on Center St., and RIGHT on Broad St. Then head LEFT on Beach St. , LEFT on Easton St., and LEFT on Lily St., continuing for 1/2 mile back to Main St. Here, continue on Pleasant St., past the Museum of African-American History, and then LEFT on Back St. to Spring St., which continues to Washington St. via Union St. LEFT on Washington St., returning to the center, where you’ll do a a couple of additional blocks. There are plenty of opportunities to add-on, with additional pleasant side streets around the center: Fair St., Orange St., etc. go for about 1/2 mile each. You can also combine this with the Brant Point route out to the lighthouse and even down to Jetties Beach.